You’re going to your caucus, right? I’ve never been and I was wondering if you could tell me what to expect? Last night I gathered with 191 of my friends and neighbor’s and we picked a . . .well, it’s not totally clear what we picked, but we picked a bunch of stuff. . .and we sort of held not exactly a caucus but not exactly a primary for president. Caucus are either the way that individuals are empowered in the political process, or they are a way for the establishment to control state politics. It really depends on whom you ask. The premise of a caucus is pretty simple. And ours opened well. I was running the sounds system. I as the A half of A/V. The V side was the Chairperson’s husband. He put together a slideshow to get us through some of the more tedious parts of the evening. We have to read the Utah party platform. . .every word. But, we found a YouTube video of it. First problem of the night was during setup. We realized that the only way to see the projector in the elementary school cafeteria we were in was to turn off the lights. . .ALL of them. We could plunge the entire room, including the registration table into darkness or we could skip the video portion. I had the sound working great. At least the stuff from his laptop. As people filed in and got registered, I decided I’d play some music. What would you pick for a political meeting? Country music? Patriotic stuff? I finally opted for jazz. It was background noise anyway. I put on Caleb Chapman’s Crescent Super Band. He lives in our little town and his band is really good. We started right at 7:00pm. And I found my first issue. The microphones were only coming out of one speaker. As we listened to someone pray and then lead us in the pledge of allegiance. I kept fiddling with my setup. The sound from the YouTube video played great. Just as we expected, no one listened anyway. Finally fixed the mics by ripping out all other connections, the music was done anyway, and just running the mics. First order of business was to figure out how to vote. There are basically three ways you can vote at a caucus. 1. Plurality: Everyone votes for their favorite candidate. The one with the most votes wins. This is the quickest, but not considered best since the “winner” won’t have gotten 50% of the vote. 2. Popular majority vote: You vote in rounds. After the first round, if no one has 50%, you drop the lowest performing candidate and vote again. Continue until someone gets 50% or more. The problem is people have to get up and vote multiple times. We had almost 200 people. That would be a long process..
3. Preference majority: Similar to the popular majority option, but you list all your candidates in the order you like them. The judges have a REALLY complicated process to narrow it down to the required number of winners. This is what we picked. Next we moved right into voting for officers. The real goal of caucus night is to get home before 10:00pm. Fortunately there were only two candidates for Chair. One vote later and our chairperson had just won reflections. (Incumbents are so hard to beat.) Next was Vice Chair. The guy who lost as Chair was quickly nominated. There were no other nominations. Congratulations, you’re the new Vice Chair and we didn’t have to vote. It’s only 8:15 and we are half way through. Next up was Secretery/Treasure. The position only really has to do anything during the caucus. One candidate and no others later, we have our next officer. And that’s where it got slow. . .really slow. We needed to elect three state delegates. A state delegate is someone who will go and choose who the party’s nominee for certain races is going to be. So, we were voting for someone who was going to go and vote for someon who we were then going to vote for in November. The delegates are expected to go and meet all the candidates. 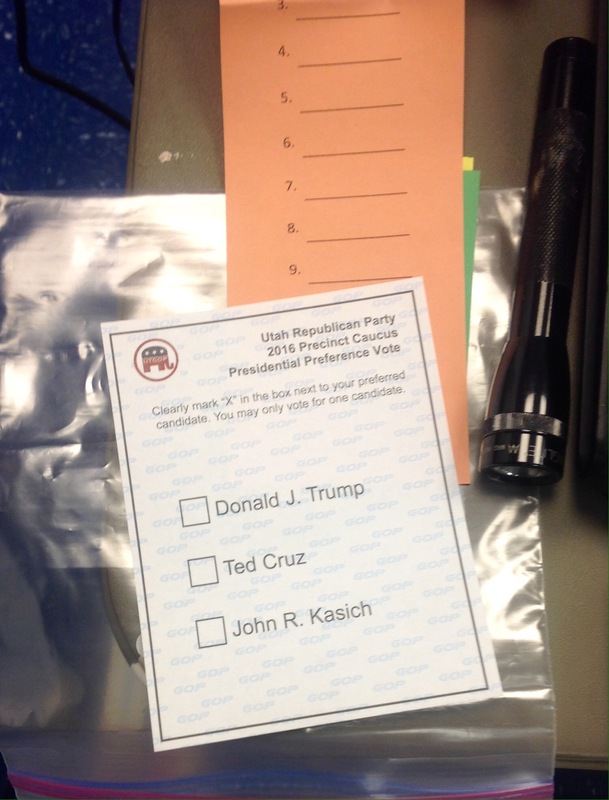 Some candidates hate Utah’s caucus system. A few years ago we had a senator from Utah named Bob Bennett. He wanted to keep being the senator from Utah. Unfortunately for him, the caucus system kicked him out. Mike Lee ended up getting his seat. Like I said, some love it, some hate it. The seven candidates for state delegate come up and each gave a brief one minute speech. I got to play sound guy. 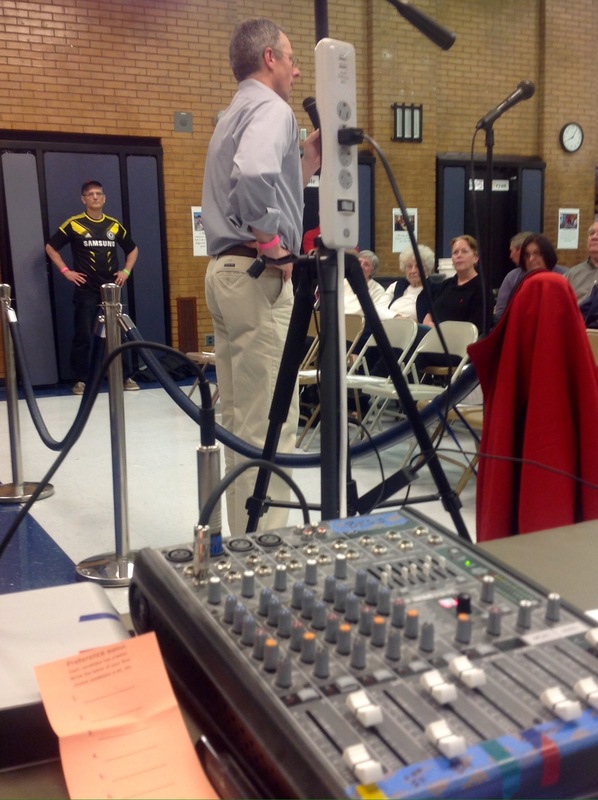 Please don’t stand directly in front of the speakers when you are talking into the microphone. So, they all came and stood behind my rope line and walked all over my wires. IN FRONT, IN FRONT of the rope! The judges took 45 minutes to figure out which 3 people were going to be our delegates. It was now about 8:50. The Chairperson opened the floor for county delegates. Now, remember that if we get the exact number of nomination as the number of positions, we don’t have to vote again. The final nominations were done a few minutes before nine pm. We had exactly five nominees for our five delegate spots. The last bit of business was the Presidential Preferance Poll. In a typical caucus, you try to recruit delegates to your candidates. We didn’t do that. We simply picked a name off the list. 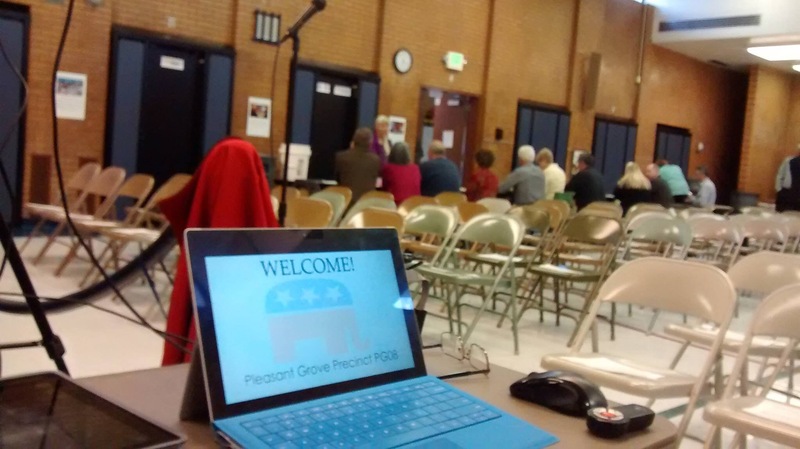 We had 191 caucus goers. Ted Cruz earned 145 of those votes. It was never a question of IF Cruz would win Utah, but simply HOW MUCH? If Cruz wins more than 50% he gets all 40 of the votes. The process was kind of messy. The vote counting, which I’d been trained on, but didn’t have to do last night, is the most complicated system I’ve ever seen. But, I think democracy, or more accurately a democratic republic, should be a little messy. It’s supposed to be hard. It’s the hard that makes it great. If it wasn’t hard, everyone would do it. Did you vote this year? Mention it in the comments. This will be my last political post until probably the election in November. It’s been a crazy election cycle. You guys in Iowa always have to choose amongst a group. Typically, by the time it’s Utah’s turn, we are endorsing whoever is the last man standing. Kind of fun to be involved when our results help pick the nominee. But politics isn’t necessarily pretty. Will be voting Saturday. Washington State is weird, we have both caucus and primary, but Democrats only count the Caucuses. Yes, they are pretty messy, worst part is those who cannot get free that day to vote. I like the meeting of minds, but it’s not very democratic. « They Did All Of That For Just An Intern?